The IZT DRM ContentServer generates a DRM multiplex from all available audio signals and data services. Moreover, it enables multi-stream real-time audio encoding and handling of all standardized and proprietary DRM data applications. The IZT DRM ContentServer is a professional system for encoding and multiplexing audio inputs, supplementary information and service data into a common data stream for Digital Radio Mondiale (DRM). The IZT DRM ContentServer supports DRM30 for broadcasting below 30 MHz (long, medium and short wave) as well as DRM+ for the broadcast spectrum between 30 MHz and 300 MHz (Band I, II and III). 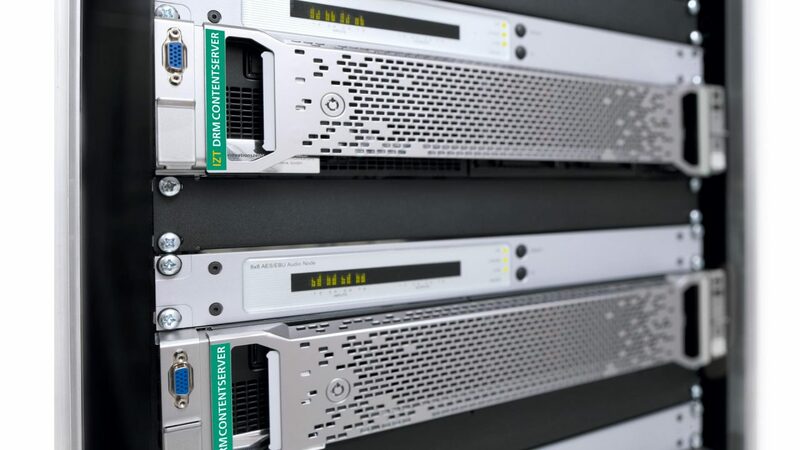 The IZT DRM ContentServer is based on highly available standard server hardware and on the proven software system from the renowned Fraunhofer IIS. The IZT DRM ContentServer makes the complete functionality of DRM available. Different editions offer an optimal selection of features and can be extended easily to flexibly adapt to changing requirements. The compact DRM all-in-one-solution offers all necessary interfaces for smooth integration into the broadcast chain. The use of standard hardware and integrated audio coding bring the benefits of lower hardware costs, cost-efficient maintenance and a significantly lower risk of failure. The Developer Edition of the IZT DRM ContentServer facilitates the development of DRM receivers. In combination with the IZT S1000 Signal Generator, a versatile laboratory setup can be achieved.